The U.S. Energy Information Administration (EIA) confirmed on Feb. 1 that the United States came this close in November to breaking the all-time single month oil production record. 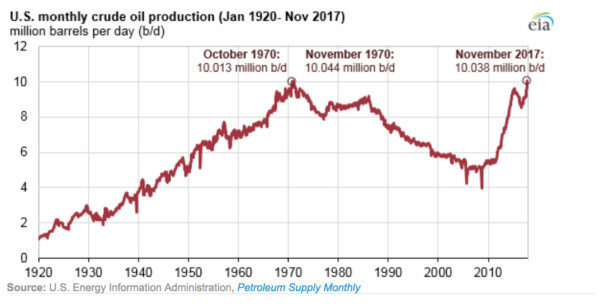 That month, the U.S. produced 10.038 million barrels per day — just 6,000 barrels shy of the all-time record set 47 years earlier in 1970. It was also the first time in as many years that U.S. production surpassed the 10 million barrel per day threshold. U.S. production peaked at that 10.044 mbd level back in 1970, but this time around the industry looks like it will continue the upward trend. Bolstered by a combination of rising prices, reduced corporate tax rates, and additional shale discoveries across the country, the oil and gas industry is placing bigger bets on future U.S. production. For example, ExxonMobil recently announced it would triple its investments in the Permian Basin, aiming to boost production to 600,000 barrels per day by 2025. That project alone would push U.S. production to new records. The company spent $6.6 billion buying new Permian acreage in late 2017, and plans to spend another $20 billion in coming years on projects across the southern United States. It’s not just the big players who are taking advantage of the favorable conditions. Murphy Oil Corp CFO John Eckart recently told Bloomberg that the company would have “great returns” in the near future. Wood Mackenzie also told the financial news service that the tax cut alone boosted the value of assets belonging to wildcatters by about $190 billion. Marathon Petroleum Corp., one of the country’s biggest refiners, has authorized a 15 percent increase in dividend payouts as a result of lower taxes, rising prices and improved business prospects. The follow-on effects are not just benefitting shareholders of oil and gas companies, however. In large part because the oil and gas industry is pursuing growth, the rest of the U.S. economy is posting gains as well. A recent article by Reuters reported that construction spending in the private sector is reaching new heights, further boosting the creation of middle-class job opportunities around the country. The shipping industry is also doing well, as exports of refined petroleum products hit a new record in November: 5.6 million barrels per day, according to Platts. Natural gas exports are poised to continue growing as well, now that Dominion Energy’s Cove Point LNG terminal in Maryland began operations on Jan. 31, providing the first major export outlet for natural gas produced in the Marcellus region. With oil and gas companies investing in new production and filling more orders for exports than ever before, it is almost a foregone conclusion that the EIA will announce in coming months that the U.S. has officially broken its all-time record for domestic production, just as the agency forecasted. Without the shale revolution – supported by innovations in hydraulic fracturing, horizontal drilling and other groundbreaking techniques – we would be facing a much bleaker future. Innovations in the energy sector have created hundreds of thousands of good jobs, spurred billions of dollars of investments, and vastly improved the country’s energy security. Our energy future is only continuing to brighten.